Abst: The Pebble deposit formed at ~90 Ma along the North American continental margin, probably far south of its present-day latitude and possibly during a transition from a contractional to a transpressional regime. Aeromagnetic anomalies in this largely covered region suggest Pebble is associated with one of a series of buried magmatic centers along the margin of a remnant ocean basin. The geologic evolution of the deposit is complex and includes at least 10 Ma of magmatism that led up to and coincided with mineralization. Grades of Cu and Au grades vary with alteration type, with the highest grades associated with relatively late development of pyrophyllite-sericite alteration. The highest Mo grades appear to be host rock controlled and are associated with intrusion of subalkalic granodiorite in the eastern part of the deposit. Exploration geochemical and mineralogical studies were designed to determine whether the concealed deposit can be detected with surface samples and to better understand the processes of metal migration from the deposit to the surface. The tilted nature of the undisturbed orebody, varying depth of cover, and later glacial processes strongly influence the geochemical responses in various media. Hydrogeochemistry (ponds, streams, and springs) and porphyry copper indicator mineral (PCIM) studies in glacial till are the most effective regional methods for vectoring to mineralization. Low-level geochemical anomalies in circum-neutral spring and pond waters from the more deeply buried part of the deposit are discernible only by using high resolution-inductively coupled plasma-mass spectrometry with lower limits of determination two and perhaps three orders of magnitude lower than traditional methods. The indicator minerals gold, jarosite, and andradite in till reveal a displaced mineralogical anomaly to the west and south of the Pebble orebody, as ore-related minerals were scraped from the orebody and deposited in till down-ice of the deposit. 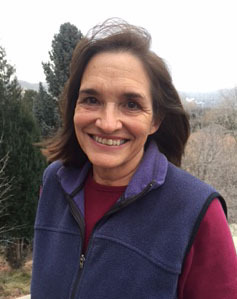 Bio: Karen Kelley received her undergraduate degree from University of Colorado at Boulder in 1979, her masters degree in 1985 (from Univ. of Nevada), and her Ph.D. degree in 1996 (Colorado School of Mines). She has spent 34 years as a research geologist at the U.S. Geological survey as an economic geologist and exploration geochemist. Her research interests have focused primarily on the genesis of sediment-hosted Pb-Zn massive sulfide deposits and developing geochemical techniques applied to assessing resources under cover.